You may have heard your coach say, “Keep your head in the game and don’t daydream.” Well, thinking about success can be the first step toward being successful. Sports psychologists call it “positive visualization.” That’s a fancy way of saying that you can picture in your head what you’re going to do before you get to do it. 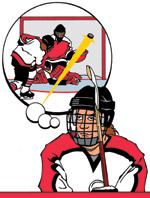 As the season winds down and you begin your march toward a league title, and possibly a USA Hockey National Championship, using positive visualization techniques will help turn your dreams into goals. 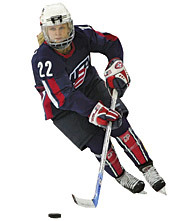 Whether it’s before a tryout or a game, try to visualize yourself out there playing and playing well in the offensive and defensive zone. Remember to do all the little things your coach taught you. Remember that it’s an important part of the whole picture of playing hockey, not just the great scoring. Coaches aren’t just looking for the huge play or the amazing shot. Go back to the basics and don’t forget what you do well. Don’t grade yourself on every pass or every play. You can pat yourself on the back if you’ve done something great, but if you feel like you’ve made a mistake, you can’t dwell on it. 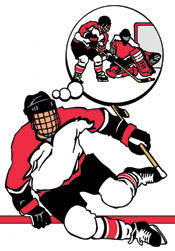 If we’re in a close game I try to visualize myself scoring the big goal. I think about what’s happened on the ice up to that point, how I’ve played and how the other team has played against me. I think about the goalie and her tendencies. Is she a butterfly-style goalie? 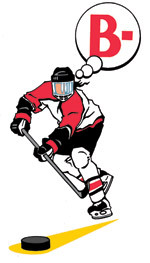 If so, maybe I picture myself going high if I get the puck in close. Visualizing myself having success helps my confidence. If I think about myself coming through in the clutch it’s almost like I’ve been there before, so I’m not as nervous. How many times have you had the puck on your stick in front of a wide-open net and missed, then you get back to the bench and think about what you should’ve done? Why not turn it around and think first and then go out there and do it? Mental preparation is just as important as the physical part when it comes to being ready to play. It’s great to give it everything you have when you hit the ice or inline rink, but it’s important to remember that it’s still a game. Losing a game or not making a team is not the end of the world. You have other things in your life. A hockey game is two hours out of your day. There’s a whole other world out there. If hockey’s not going well, you still have a life to live.